I'm going to take a break from the whacky world of local politics and focus my attention on the events happening at the Connecticut Film Festival. If you haven't attended any of the events, then get yourself downtown this weekend and check out what's happening. For a full list of events, click here. Not only will I bring you coverage from the festival this weekend, I'm also a panelist at one of the events. If you want to hear my rant on the evolution of blogging and online journalism, come down to the New Media Frontiers panel TODAY at 2:20 at the Polish American Center, Ives Street. On a more serious note, if you're into listening to good music for a good cause, then PLEASE come down to the Multiple Sclerosis benefit today from 4PM to 2AM at Cousin Larry's on Elm Street. Earlier this week, I interviewed the person who's putting on the event, my friend Jeff Goresen, who talked about the origins of the fundraiser. If you're in looking for something to do at the festival besides watching movies or attending panels, come on down to Cousin Larry's and show Jeff your support! From Eileen FitzGerald's interview with Danbury Superintendent Sal Pascarella regarding the now infamous school board "principal search" trip to Arizona. The school district was harshly criticized by Mayor Mark Boughton and the Common Council this week for spending about $3,000 for five people to travel to Arizona to visit Rossi's school last week. Okay, based on the article ALONE, we now know that last week, Pascarella, assistant high school principals Gary Bocaccio and Jesse Ballenger, and school board members Rachael Austin and Irving Fox, went to Arizona to visit the candidate's [Robert Rossi Principal, Desert Edge High School, Goodyear, Ariz] place of employment and do some observations. 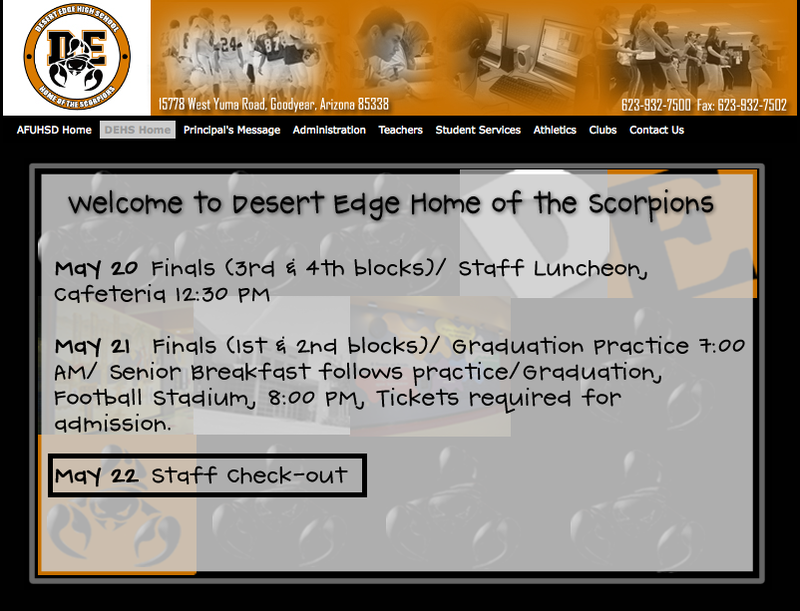 Well, Desert Edge High School has a website...and here's what they have to say (note the section in the black rectangle). The Superintendent of School, two assistant principals and a Democratic and Republican member of the Board of Education took a trip to Arizona to visit and observe a candidate for principal of Danbury High School last week (May 24-May 30) YET, based on it's own website, Desert Edge High School had no kids or staff as of May 22nd? ...and of course, the News-Times article makes no mention of this FINE detail. In closing, a quote from Dr. Sal. "That's why we go and make site visits,'' he said. "We do Google searches, check things out, and then go face to face, he said. "We want to get the best people in the position." "Because we've had such a high turnover (of leaders) at the high school, it was important to have veteran high school administrators there [at the Arizona visit]. In 10 years, we have had five principals at the high school. I needed to have their (assistant principals') input and their eyes." 1. I don't know how one "check things out" when the school you've visiting is closed. 2. I don't know how assistant principals give their input when the STAFF and KIDS at the high school are gone for the summer (i.e., NO REGULAR CLASSES ARE BEING TAUGHT). As every day goes by, more questions pop up regarding this entire fiasco...hopefully, soon the public will be provided answers from ALL PARTIES involved in this situation. Pascarella continued to defend taking assistant high school principals Gary Bocaccio and Jesse Ballenger, and school board members Rachael Austin and Irving Fox, with him to visit the candidate's school. "We're going to pay $140,000 for the job, so we want to be sure," Pascarella said Thursday. "Because we've had such a high turnover (of leaders) at the high school, it was important to have veteran high school administrators there. "In 10 years, we have had five principals at the high school. I needed to have their (assistant principals') input and their eyes." Pascarella also said the district saved money by not hiring a search firm. Robert Rader, executive director of the Connecticut Association of Boards of Education, said a CABE search firm may charge as much as $20,000, depending on the scope of the search -- which includes site visits. "In many cases, the pool of people available to take the jobs is small," Rader said. "It's becoming harder and harder to find people in Connecticut. The truth is there is salary compression." Principals make more money than teachers, but they have more responsibilities and work much longer hours. The same is true for the difference between principals and superintendents, he said. Boughton, who was a social studies teacher at the high school for nearly 14 years before entering politics, said he knows for a fact there were "internal candidates who were discouraged from applying" for the job. "That's a problem," he said. "I know these individuals and I know they are capable of leading that school." Hopefully, this alarming charge from the mayor will be addressed soon. Until then, you can read the entire story with Superintendent Pascarella over at the News-Times. After conducting my phone interview with Democratic Common Councilman Tom Saadi, I think it's fair to say that the Minority Leader is a bit upset. 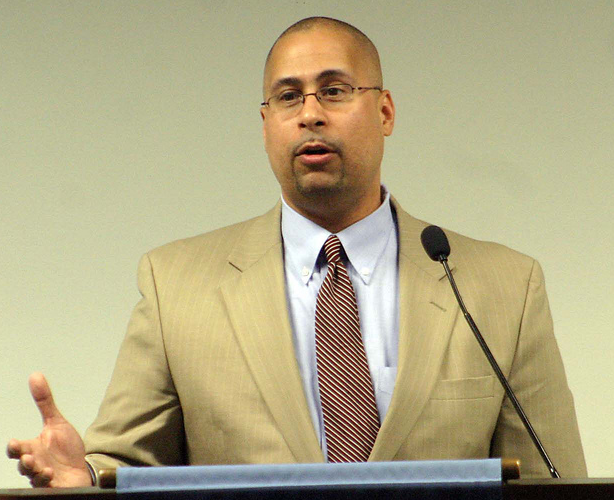 For months, Saadi has been calling upon school administrators to give back some of the salary increases they've received as part of an arbitrated settlement between school administrators and the city. What prompted this request was the revelation by Saadi, during at meeting in Feb., that two middle school principals were receiving a nice percent pay increase while the city was requesting teachers to give cutbacks in order to help with the city's budget. 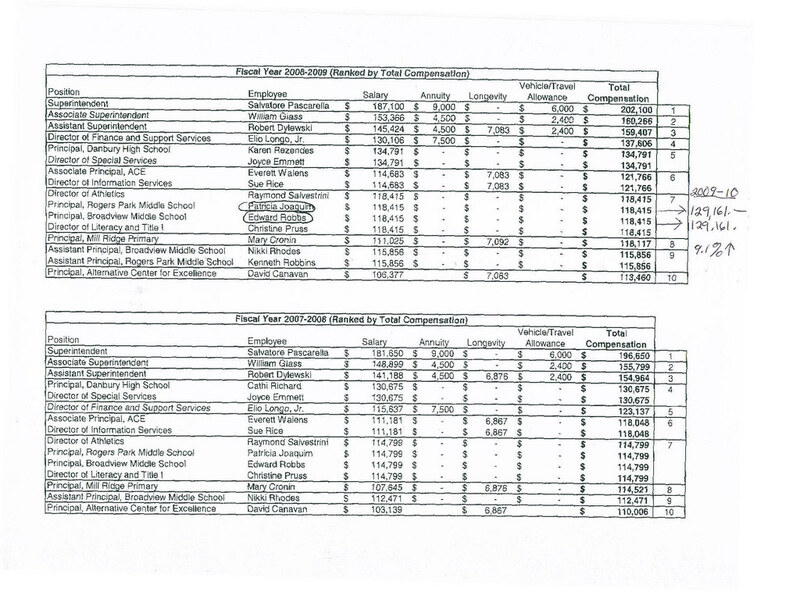 NOTE: Here's a copy of the salary spreadsheet that's being referenced by Minority Leader Saadi (click to enlarge). The principals in question (Broadview and Rogers Park Middle School) are circled and their scheduled pay increases are written on the right hand side of the spreadsheet (click to enlarge). Everyone up to date...good, lets continue. In light of the school administrative salary increases, which were releaved in Feb., Saadi suggested that, in a show of good faith, school administrators follow the lead of teachers and also provide givebacks to the city. 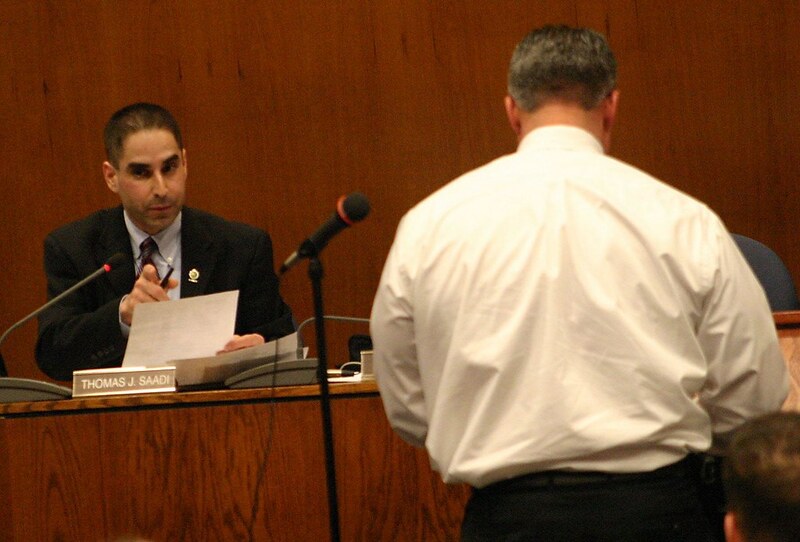 For months, at the end of the Common Council meetings, Saadi has been requesting School Superintendent Sal Pascarella for an update regarding giveback school administators...with no success. Then this week, the revelation of the school board's trip to Arizona to interview a candidate for the high school came to light...and the level of outrage from Saadi and others went through the roof. From today, here's my interview with Saadi in which he expresses his displeasure with the entire situation. ...lets just say that this story is far from over. The jazz group "Blue! "entertained the crowd at Cousin Larry's. Cousin Larry's: Elm Street 06.02.09 Photo by CTBlogger. For those who claim that there isn't any good music in the area..I'm here to prove you wrong. Meet "Blue! 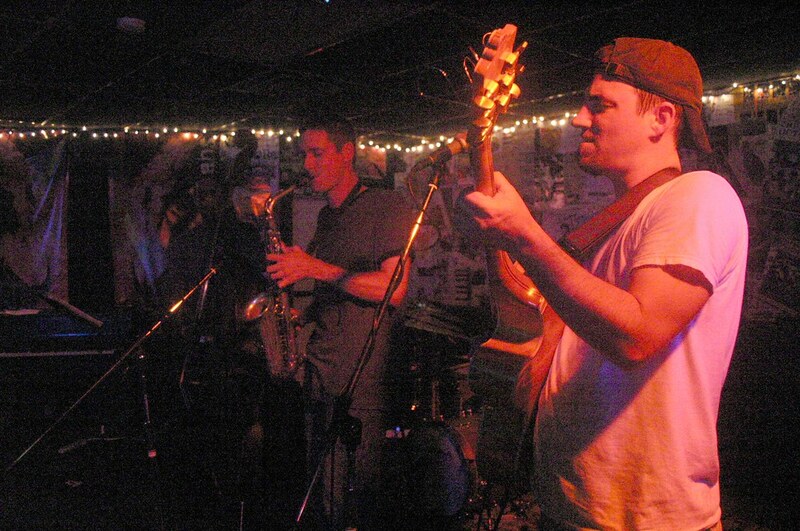 ", a local jazz group that's been tearing up the area with their music for years. Once a staple of the Wednesday night scene of the 90s at the old Hat City Ale House (now names City Ale House), Blue was now makes regular appearances at Cousin Larry's on Elm Street. Last night, I ventured out downtown to see the jazz group and lets just say that they didn't disappoint. From last night, here's audio footage of the last song of the night. If your not doing anything, make sure to check these guys out. You can find more info on Blue! and other groups playing at Cousin Larry's by clicking here. By popular demand, from Monday's Common Council meeting, here's footage of the discussion regarding the school board's trip to Arizona. After the Common Council meeting on Monday night, I had a chance to interview Common Councilman Warren Levy and get his take of the controversy surrounding the school board's trip to Arizona. I know the whole board of education trip to Arizona has people worked up a bit BUT, this astonishing piece of "reporting" from The News-Times' Dirk Perrefort left me shaking my head. Perrefort allows Boughton to spew out a charge like this without asking a follow-up? Any reporter worth their paycheck would peppered the last honest man in Danbury with a series of questions after making such a remark. As a former school teacher, if "internal candidates" were "discouraged from applying" for the job," what did you do to address the situation? Did you talk to anyone of the board about these charges you heard? Did candidates come and complain to you directly about the situation or did you receive this information from second-hand sources? Since you threw this charge out there, can you provide the names of the people who were discouraged from applying? If you refuse to provide that information, than isn't what you said nothing more than hearsay? If "internal candidates" were "discouraged from applying" was a concern for you, why are you bringing up the topic now as opposed to making this disturbing development known to the public when it first happened...by the way, when DID YOU first learn about this? You see where I'm getting at here? There is NO WAY a mayor (or any elected official) would be able to get away with making a statement like the one Mayor Boughton made without a series of follow-up questions if we lived in Hartford, Stamford, New Haven or areas where a real media presence would have held this mayor's feet to the fire. Trust me, writers such as CT Posts' Ken Dixon, former Hartford Courant reporter Mark Pazniokas, or New London Day's Ted Mann, would have peppered Boughton with follow-up quesitons after uttering such an incredible remark...as well as allowed people such as board of education chairwoman Susan Podhajski and School Superintendent Sal Pascarella an oppurtunity to respond to Boughton's claim. ...hell, this charge from Boughton demands an entire side-bar article. The Danbury News-Times has an obligation to hold public officials accountable for their remarks to the press. For comments like this to go unquestioned is complete disservice to the public. 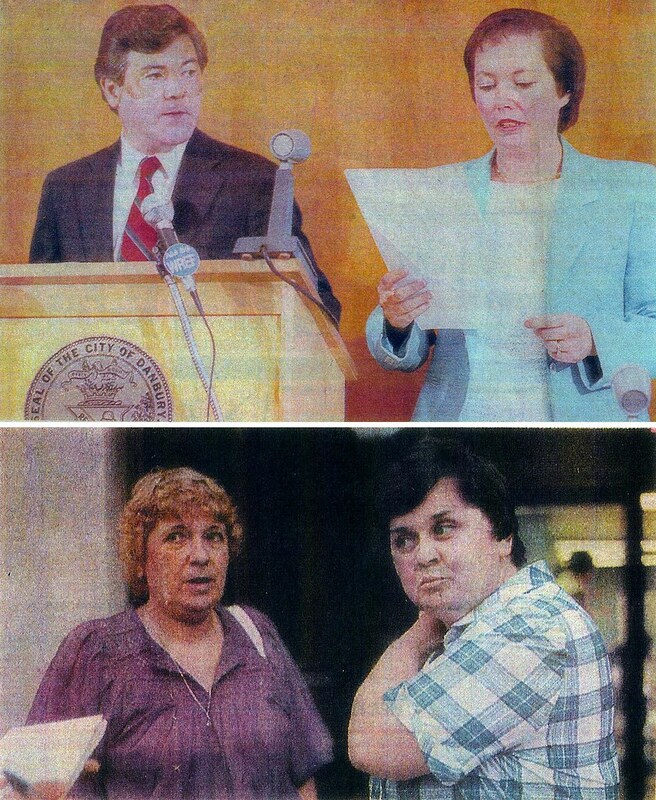 This week marks the 22st year anniversary of what many have come to call either the city hall midnight massacre. If you want to have a better understanding of Danbury's current political landscape (or the close relationship between Democrats and Republicans in the city), this incredibly nutty episode would be a good starting point...as many of the Democrats involved in this nonsense are currently Republicans. The Connecticut Film Festival is here again and the debate on whether or not the event was worth the price (in terms of taxpayers dollars) is bound to come up again. As you know, last year I was HIGHLY critical of the job City Center Danbury in terns of getting businesses along Main, White, and Ives Street involved with the festival. Now granted, last year was the first year the event was held in Danbury but, at a price tag of 75,000, I wouldn't necessarily consider the city's involvement with the festival (in terms of getting the community businesses involved; marketing) a complete success. Here's my report from opening night last year. ...remembering that the city was told that this event would people in aprox. 5,000 over the course of the entire event, which would result in people eating, drinking, and partying downtown (a.k.a. spend money in downtown businesses), take a look at MY footage from opening night. Make sure to check the footage of all the restaurants on Ives, White, and Main Street. Will city funding of the festival pay off this year? That's yet to be determined but I'll be providing my opinion on the festivities as I plan on reporting on a number of events at the festival and check on the impact the event is having on businesses in the downtown area. I'll also provide everyone with a video retrospective on the various ad-hoc committees and discussion at City Hall regarding the funding of the festival. For information on everything happening at the festival, just click here. * full disclosure: I am a member of the "New Media Frontiers" panel at the Film Festival). Today, I'm happy to announce that I'll be blogging for the Hearst Connecticut Media Group. ...in other words, I'm now blogging for the Danbury News-Times. 1. Adding my voice to reporter's articles (i.e., video footage, follow-up reports). 2. Reporting on subject matter that's not being covered or being overlook at the local media. Unlike here, I'm not going to be posting at the Hearst Connecticut Media Group on a daily basis but I WILL be providing people with information about topics in the Greater Danbury Area which is being overlooked. Make sure to bookmark my new site and check out my postings once I start...I'm going to start posting some time this week (and trust me, my first post is going to be REAL good. And wait till I disclose the other two announcements...oh, this is going to be FUN! State Rep Jason Bartlett's long fight in addressing high school drop out rates jumped a major hurdle last week with the passage of his bill which will raise the age students can dump high school. As you know, Rep. Bartlett has been pushing for passage of this legislation for months and has done a guest post on My Left Nutmeg about the merits of the bill. Although the bill died in committee, Rep. Bartlett led the charge and, with supporters of the legislation, petitioned to have the bill be moved to the House chamber. Dropping out at 16 is simply not adequate, and having a law on the books that allows kids to do that sends a wrong message. There’s an extremely competitive market for jobs right now, and having an education is critical for earning a living wage. It was a hard-fought battle to get this change, but I am glad that my colleagues joined with me and understand the reasons why this is so important,” Bartlett remarked. “If we are going to remain competitive, if we are going to advance the needs of generations coming after us, then this is one important change we can make that will have an impact. I am hopeful that my colleagues in the Senate will realize how important this legislation is and pass the bill in concurrence with the House. From Thursday, here are highlights from debate on Rep. Bartlett's drop out bill.